What is the size of these tiles? I think we need larger than 2x6 or 3x6 to do the design in the center, is that right? Which ever you like. The chair rail is thicker and more formal looking, generally. The liner is thinner and more stream lined and contemporary or casual in feel. There aren't any "rules". seam in marble countertop, - How did your fabricators make the seam in your marble look so clean? Don't use marble in kitchen, it stains. Coffee pot question - Where do people put the coffee pot? I see these stunning kitchens, but no coffee area/station. Seems hard to pull in and out of cupboard daily. Any ideas? I think my next reno I will put a coffee station in my bedroom or bathroom. Seems nice to start the day with it while I get ready. What do other people do? The new pod machines would work well in a bath or closet. 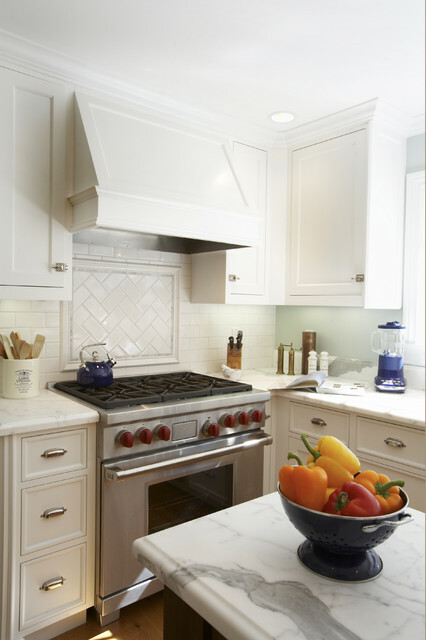 Casa Blanca Tile offers handmade ceramic tiles & molding to create this classic backsplash. Are these countertops calacatta gold? They are beautiful. What qualities should I look for when selecting this type of marble? I believe it is Calcutta as well. Size of Subway Tile? 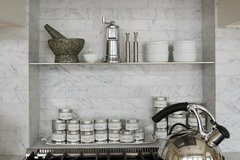 - Anyone know what size subway tile was used here for the herringbone pattern? Thank you Mahoney Architects and Interiors. any idea on the paint color of the walls? Valspar's Sky Light View is a similar color. How close is the stove to the corner? Is there a cabinet next to it, or just a filler. And does the drawer to the right open? It looks like it would hit the side of the stove. I'd like to do this too...please help! Hey Roxanne --- I think you just spotted a problem ! Good call ! 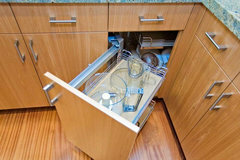 In the photo it appears to be very close, but in fact there is enough clearance for the drawer to open. who are the cup pulls made by? These were chosen by our client. We do not have the specs on those. For a small space this is a practical solution. In the past, the dead corner on the right could have been problematic - but these days there are lots of elegant solutions to accessing that space. What are the best options for a stove backsplash? There are several options, depending on your kitchen, and how much space you have between your stove and the hood, can help you decide. You can use tile (like shown above) with a patterned insert. You can continue your countertop surface up the back wall - such as granite or marble. For a more industrial feel you could use stainless steel. Many people enjoy using decorative mosaics and even hammered tin can be used. Here is an idea book that will give you more ideas. We like tile for a stove backsplash, easy to clean and beautiful to look at. Can someone tell me what colour the cabinets are painted? It's a particularly nice shade of white. Are the countertops Marble or Corian look-alike? it could be dove white (white dove?) by Benjamin Moore. I just ordered cabinets for my kitchen, and said I wanted white, but not a stark white, more like a milky creamy white, and the designer immediately suggested that color. White - Which white did you select for your cabinets? Lovely space! We don't know wha shade of white that is, but visit your local paint dealer for the latest low/no VOC colors. Love the hardware. Who makes the cup pulls and latches? This kitchen was completed several years ago. I would look for up to date specs for cabinet hardware. hOW MUCH IS THE STOVW HOOD? We don't have the price on hand, but check out your local showroom for current prices. Could someone advise what kind of cabinet is used on upper cabinets next to stove and where to find? Subway tiles are everywhere these days—not that I'm complaining. The simple white style is helpful in myriad applications. But why not mix it up in an unexpected pattern? One of my favorite designs is subway tile paired with a framed herringbone feature. The effect is subtle and elegant. 2. What’s a good guideline for BTUs?This is another case where more is not necessarily better. Unlike restaurant chefs, who require a lot of power on every burner for plenty of high-heat cooking, you’re more likely to want a wide variety of heat options for cooking all the different components of your meal.